Constantly faced with the question, we are taking a look back on Margaret’s legacy and attempt to answer the question, What Would Margaret Do, while looking at modern situations through the lens of Margaret. Our two previous blogs in the series looked at discrimination-both racial and religious, and the education system in America and its transformation over the centuries; today, our focus will shift to Women’s Rights, and the continued modern fight for equality. Margaret had been a staunch supporter of the women’s rights movement from the very beginning in Leadville, and made no qualms about the fact that she believed in her right to be heard on varying subjects, whether her opinion was solicited or not, because simply enough, she was a grown woman, living in America. 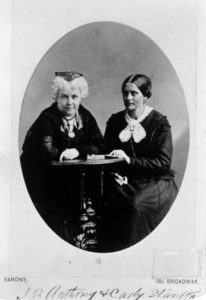 When we look back historically on the women’s suffrage movement, we see it as an immediate and faithful gathering of women who have banded together to force a common understanding; in reality, the founders themselves had a difficult time agreeing on what exactly it was that they were fighting for. Some believed that women simply needed to have a hold of their autonomy in their personal lives and communities. Many others believed that suffrage meant a clear and even field in which to express themselves on every level, including federally. 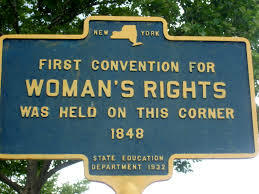 History remembers the movement for equality starting on July 19th, 1848 in Seneca Falls, New York organized by Caty Elizabeth Stanton and Lucretia Mott, gathering no more than 100 supporters, nearly ⅔ being women. From the very beginning, the idea of being a feminist has been one of equality for all, across the board; to have multiple genders represented at the first meeting was important and powerful for the message they would begin to perpetuate. The most notable thing to come out of the convention was the Declaration of Sentiments, Grievances, and Resolutions. Fashioned in the same essence of the Declaration of Independence, arguing for nearly the same points, focusing on an all-inclusive declaration of independence by, We the People in which women were, shockingly, considered human and equal to a man. The fractional interior of the movement could quickly be seen on the surface. While the implicit idea that women should be treated as the free and independent citizens that they were in and of itself doesn’t initially appear hard to accomplish, supporters began to see that this notion of full and unimpeded equality as a necessity was a hard pill to swallow for the prevailing male, and sometimes female, public. The notion was a simple one, focus on the societal barriers that take a woman’s autonomy: family responsibilities, lack of economic and educational opportunities, and the lack of a voice in political debates. As the movement begins to gain momentum, it also gains some of its most infamous supports such as Susan B. Anthony, whose cries to “Agitate, Educate, Organize” began to echo across the country. Anthony’s belief that “no man is good enough to govern any woman without her consent” or that “modern invention has banished the spinning wheel, and the same law of progress makes the woman of today a different woman from her grandmother” could easily be suppliment into modern cries for equality. Together, Anthony and Stanton would fight for the remainder of their lives in the name of equality, even lobbying Congress to include women in the freshly minted 14th and 15th Amendments (allowing all freedmen, voting and citizenship rights) to the Constitution of the United States. The post-Civil War reconstruction era, brought about reconstruction to the movement that began nearly 20 years earlier. The overwhelming fear of marginalization by society as zealots for “social issues”, the movement began to focus near exclusively on the right to vote. The intense focus on a single issue created two distinct sectors within the larger group: Stanton and Anthony’s National Women Suffrage Association focused exclusively on changing federal law as a whole towards women, particularly the 15th Amendment, as it excluded women. Lucy Stone would take an alternative route while advocating for the rights of women, she established the American Woman Suffrage Association and focused on making changes at the state level, in order to influence change at the federal level. However, both factions would run into larger problems, including the lack of widespread support of either. Historian Nancy Woloch eloquently described early efforts as “a crusade in political education by women and for women, and for most of its existence, a crusade in a search for a constituency.” It is important to remember as well, that for many in the movement it was about enfranchisement for all; this was not just a movement for and perpetrated by Anglo women. 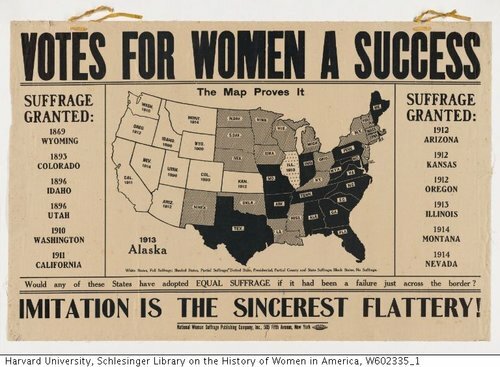 The fight for equality was one that crossed racial boundaries as well, which may have been a factor in the numerous reasons why men, particularly anglo men, wouldn’t become ardent supporters of suffrage. 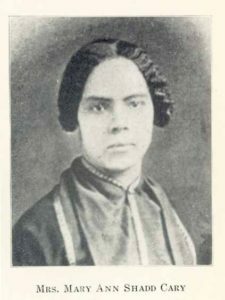 The American Woman Suffrage Association would proudly call women like Sojourner Truth, Margaretta Fourten and Mary Ann Shadd Cary members and received overwhelming support from the black community as their platform called for the enfranchisement of black men as well. The West has always held a place in historical memory as a place for those that thrive in adventure, relish in pulling themselves up by their bootstraps and most importantly, a place for those who believe in blazing their own trails. 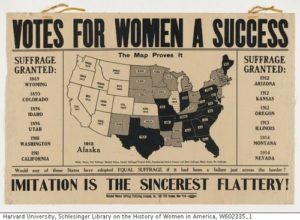 Western altitude, brings Western attitudes, so it is no surprise that the first territories and states to grant their women the right to vote were Western; The Wyoming Territory gave women complete voting rights in 1869, followed by Colorado (1893), Utah (1896) and Idaho (1896). Although Colorado was the first state to grant women the right to vote it was not an easy process to say the least. Calls for women’s suffrage began as early as 1877 when then Governor Edward McCook urged Colorado legislatures to follow in the footsteps of the Wyoming Territory and grant women their inalienable right. Rejected unequivocally by legislators, an attempt was made again between 1875 and 1876 by delegates during the drafting of the state constitution to include full and equal suffrage, however, this attempt was also foiled by fellow delegates. The early, twice defeated, suffrage attempt didn’t deter the women of Colorado, and 1893 seemed like the best time to affect change. Led by the Colorado Non-Partisan Equal Suffrage Association, the race for equality had just shifted into high gear, with women in southern Colorado threatening to run their anti-suffrage state senator out of the area! The political landscape had also begun to shift, with the movement gaining solid support from Governor Davis Waite and former Governor John Routt. The state had changed within those last few years as well, making the passage of suffrage a viable reality; the large Hispano community that played a large part in the loss of the 1877 ballot had seen their representation within the population shrink significantly. Because of this, many enfranchised Coloradans believed that by allowing women the right to vote in elections “would give native-born residents more ballots than foreigners.” The women of the state weren’t opposed to getting out there and putting in the work to gain true equality in their state and country; female doctors such as Dr. Ethel Strasser, Dr. Anna Chamberlain, writers such as Minnie Reynolds and Patience Stapleton, socialites such as Mrs. Nathaniel P. Hill, Elizabeth “Baby Doe” Tabor and Margaret Brown would all be called to action-lending names, funds and office space. The dedication paid off as the referendum was passed by a 6,000 vote margin. Taking the political high road in Colorado had seemed to work out for the now enfranchised women of the state, but on a larger national scale, the movement had become stagnate. Across the country women were beginning to band together to cry for equality. Newport, Rhode Island would become an inadvertent hub of suffragette activity. A highly popular resort town on the east coast, that catered to the New York (and general) elite, it was a town that was supported by the money of the husbands, but by the voraciousness of its women. Margaret herself had owned a cottage in Newport and had begun to travel to the city regularly by 1910. It’s no coincidence that Margaret was attracted to this once sleepy little coastal town; the spirit of the women here, in particular Alva Vanderbilt Belmont, would allow Margaret to find a niche of strong women who were just as vocal about injustices as she. Alva was the east coast version of Margaret, a woman born into poverty who was lucky enough to have fallen in love with a rich man, with a strong held belief in human rights and equality for all. Mirroring the life of Margaret, who had separated from J.J. after years of marriage, Alva and her husband Willie Vanderbilt divorced in 1895, ostracizing herself from members of society. Not letting that hold her back, after she remarried Oliver Belmont in 1896, she hit the ground with extreme motivation to gain the vote for women, and more importantly, equal footing in a shared society. Becoming a member of many suffragette associations across the United States and abroad, she would make connections with women like Margaret Brown that would effectively change the shape of the Nation. Margaret would end up becoming a member of Belmont’s Political Equality League, to which she was a very prominent member to a very “vocal president.” Seeing as Margaret was a woman of action, Belmont helped to play a significant role in supporting Margaret’s desires to run for Congress early on, holding tight to the belief that “true change would happen only when women held political office.” Margaret didn’t have to shoot for the moon too much, the first woman to ever hold a senate seat, Helen Ring Robinson, was up for re-election in where else, Colorado. The rising tide of women was being seen across the country, and Margaret was going to make sure that she would remain unsinkable, even in this. 1913 saw the arrival of Alice Paul to the States, who had helped with the English suffrage movement, and established the Congressional Union, later National Woman’s Party, and her adoption of more militant tactics like those seen in England. Paul’s confrontational style called for picketing and mass rallies to raise public awareness, this tactic drew in a younger generation and helped to rejuvenate the federal fight for equality. This tidal rise in support of the renewed suffrage movement had reinvigorated Carrie Chapman Catt, president of the NAWSA; Her “winning plan” was to build on the success of western women and watch it spread across the country. Soon enough, victories followed in Arkansas and New York granting partial voting rights in 1915. The culmination of the last two years was at least partially worthwhile in 1917, when Jeannette Rankin of Montana was elected and sworn into the 65th Congress of the United States, she would be the first woman to serve in our country’s legislature. The addition of the US to World War I in 1917 played well to those crusading for suffrage-exclaiming that the “effort to make the world safe for democracy ought to begin at home, by extending the franchise. Moreover, they insisted, the failure to extend the vote to women might impede their participation in the war effort just when they were most needed to play a greater role as workers and volunteers outside the home.” In a direct response to these calls the House passed an equal voting rights amendment on January 10th, 1918, however, the Senate did not vote to pass prior to the end of the 65th Congress. It wouldn’t be until after the war had ended that women would become completely enfranchised within the US, seeing the House vote with a resounding YAY on May 21st, 1919, and the Senate agreeing on June 14th, 1919. A year later, August 18th, 1920 would see the 19th Amendment fully ratified. When asking What Would Margaret Do, we have to take a look at the events that led to the March and the important aspects of the movement that hold it up, and progress it forward; in an article with the New York Times, the four founders of the movement joined together and came to the summation that after “Trump’s victory [it] revealed deep fissures in the American social and political landscape that prompted many people who had no previous experience in activism to seek an outlet for their fear and anger.” On the surface, it appears to check off a few of the boxes that would have been important to mobilizing Margaret to action, including a heavy reliance on educating the diverse community on the causes that make us common. On a deeper level, they make the point that every person has the capability to become an activist, the difficulty comes in finding the passion that ignites your activism. For Margaret, that came in numerous different ways: labor, children, animals, immigrants, women’s rights, etc. and manifested itself throughout the entirety of her life. One of the many challenges that Margaret had faced early on, particularly before the Brown’s had money, was that many people couldn’t believe a woman to actually be in a role of leadership; feelings within the same vein had started to culminate in the United States throughout the last election year, in which I think we can all agree, was a difficult year, no matter which candidate you supported. A prime goal of the organization of women across the country for their march was to instill a fierce sense of female leadership within the souls of women across the world. One of the most difficult aspects of what is now known as the 4th wave of feminism, which can essentially be traced back through all waves, is in the aspect of intersectionality. Are we making sure that the diverse people who make up this country are truly represented in this new fight for autonomy and equality? Organizers actively made sure that, “diverse members of different races, ethnicities, gender identities, levels of experience, ages, regions…to ensure that the needs and desires of those communities are represented in the march’s principles” recognizing that each and every one of these factors are “contingent and codependent” guaranteeing that every woman’s voice in the country is heard, allowing the world wide Women’s March to become known as “the most diverse march for women’s rights ever”. While on the surface, for many, the Women’s March and the motivations behind it were obvious, but just as with Margaret’s fight for the right, there were many citizens who didn’t necessarily understand what, exactly it was, that these women were marching for. Citing the very movements that Margaret had been a key player in, those not marching in 2017 were struggling to understand what this march for equality was for, when women like Margaret Brown had already successfully marched and gained a more equal station with men, for the women of the country. How much more equal would you like to be? Interestingly enough, Margaret and her compatriots would have been faced with these same slings of arrows. So now, we leave the analysis to you, What Would Margaret Do, when faced with the Women’s March held in 2017? Would she have been an active supporter, or would she have been one of the organizers? Would the heavy reliance on the intersectionality of women’s rights be an appeal to her, considering the racial justice’s she tried to seek for most of her life? Would the general call to equality, in all forms, be enough to call her and her influence forward? Would she be on the fence about it, noting that the autonomy that women are marching for now is miniscule in terms of the fight for the vote? Would she fall in line with the believers who say you have the right to vote, to affect change through political avenues, use your voice in that regard. Or would she take a seemingly different route altogether? Having run for Congress three times in her life, would she be on the grassroots levels encouraging women to run for every type of political office imaginable, to effect change at the highest levels by forming it at the lowest levels? In truth and reality, we will never know, despite Margaret being a woman severely ahead of her time, we have lost her autobiography manuscript to history and may never know her feelings towards the future, and the struggles she envisioned it to encounter. 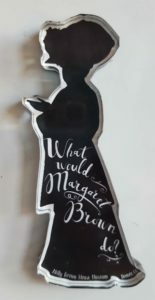 So we ask, What Would Margaret Do?